Earlier this week, I made my largest purchase from the Cartel Market yet. I spent around 1,400 Cartel Coins, which I had saved up, on the Gold Scalene armor set. With this weeks patch, it was removed from the Cartel Market, so I decided to take the plunge. 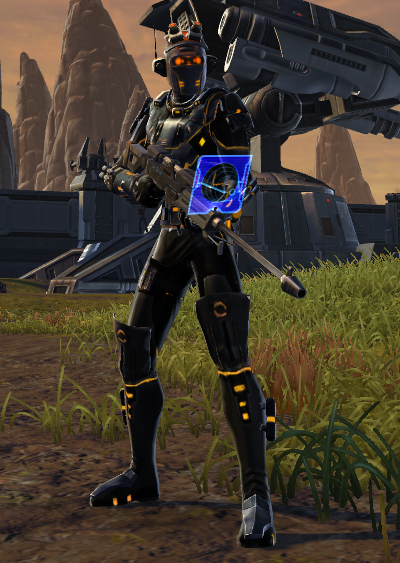 I bought the set for my Imperial Agent, who is still only level 16. It seemed like a better fit than buying the Covert Uniform or Imperial Flight suit, being that I am supposed to be undercover sometimes. Overall, I think the it looks very cool. I do have a problem though. Since it is custom armor I must supply all the mods. I can make Mods and Armoring, but currently have no character which can craft Enhancements. So it looks like I'll be rolling a new character this weekend. For my forth character, I am going with a Sith Inquisitor. He will take up Artiface so I can craft Enhancements. There is no better time to do this since BioWare announced double XP weekends, starting this weekend! I should be able to level him by doing just Class missions for a while with the right boosts and legacy unlocks.